Hi friends! Boy, do we have some fun things in store for you today! 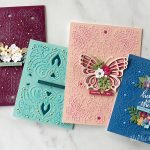 Since fellow licensed designer, Seth Apter is being featured this week on the blog, we decided to support his endeavors on Maker Moments by bringing some cool projects for you to make using his dies. amazing mixed media artist from New York. His style and techniques are unique and we know you are going to love what you see him showcase! Since you know Maker Moments is about simplicity, we decided to design something very basic and anything but mixed media. It is our hope that you all will be able to embrace whatever Seth’s die designs are because they are truly so universal in application. We want you to see these abstract dies in their simplest forms. For our first clipboard, we changed the color of the clip with gold spray paint and added the background paper to the board portion. The white paper is cut on a diagonal and only adhered to the board on two sides so that it can be a pocket! Die-cut the Take Flight pieces from black and gold cardstock. Finally, we attached the sentiment piece to the clipboard using a pop-dot. The Flight piece went directly onto around the Fly piece. own verbiage? You can always stamp a sentiment with permanent ink, but really, take a stab at your own writing. These days the very imperfect is in. Yay! Add a strip of gold paper at the base of the watercolor paper. We die-cut the Take Flight pieces from black cardstock and then adhered the Fly sentiment to glittered paper. Assemble and attach to the board with a pop-dot. This final project is definitely more detailed. Although not necessarily a full-blown mixed-media design, it is definitely a paper-layered abstract. We adhered lots of paper (notice the paint strip) but we kept the colors to a minimum. With all the layering going on, the project can look busy if too many colors are added. This time we not only incorporated the Take Flight set, but added the dies Robo Bar and Robo Star as well. 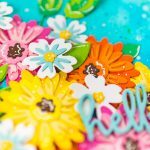 The tiny details that were added to those die-cut pieces, like pen and ink, are indicative of Seth’s style. We included a paint strip, some twine, a vintage key ring and some typed sentiments. We couldn’t help but put a black and white photo to the right of the board. This is a sign that is on the art room door at Better Homes & Gardens main office. It is their definition of creative. Thought it was so appropriate! Anyway, you notice we did some layering but we were happy with the outcome. 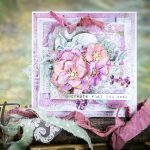 what Seth is up to on the Spellbinders blog. Creative inspiration from our in-house designers Debi Adams & Michelle Ridge!